Some time in mid-January, I was thinking about various organizational patterns and how companies run. I was thinking, in particular, about the idea of a "leadership team". I dropped a thought into Hootsuite and a couple of weeks later, on February 6, that thought was broadcast over a few social media channels. I got a few different responses, all of which amounted to "please say more about this." I want to make it clear that this is a thing I am still pondering and a lot of this post is ideas I've not shared broadly or discussed at length. Right now, I think of a leadership team as an organizational smell. Like a code smell, an organizational smell potentially indicates a deeper problem in the system. The smell itself, in this case the existence of a leadership team, is not technically a problem. A leadership team doesn't prevent an organization from functioning. But the existence of a leadership team may indicate perceived weaknesses in the overall system. Maybe we're attempting to compensate for these weaknesses by centralizing authority and decision making. Maybe we see no weaknesses and we can easily rationalize this centralization. After all, the members of a leadership team are nearly always the individuals at the top of the organizational chart. In such a case, we may be rationalizing the existence of a smell with a misapplied organizational design pattern. Like software design patterns, I think of organizational design patterns as not final repeatable prescriptions, but templates. Dominator hierarchy is an organizational design pattern optimal for repeatable work. With a dominator hierarchy, there is a static pyramidal structure with a clear chain of command, decisions are made at the top and people identify with specific job titles within the hierarchy. 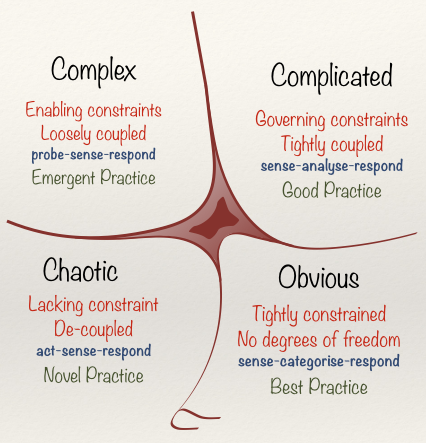 This is the right organizational pattern for what Professor David J. Snowden refers to as the chaotic and obvious domains in the Cynefin framework. While dominator hierarchy works in both of these domains, the optimal management styles differ from command to coordination for chaotic and obvious, respectively. For the complicated domain, the Supportive Hierarchy is an appropriate organizational design pattern. In the Supportive Hierarchy, the reporting structures are similar to dominator hierarchy, but there is an emphasis is on empowering employees. Management style moves from being controller and coordinator, to mentor. Employees have more freedom. Decision making protocols are in place, allowing employees high levels of autonomy. Servant leadership is another common and effective management style here. Implementing a hierarchy in the complex domain is not technically a problem as it doesn't stop the organization from functioning. But hierarchy of any form is a suboptimal structure for an organization that needs to respond quickly to unpredictable changes in the market. For the complex domain, the optimal organizational design pattern is a Decentralized Network and the management style is facilitative, but the roles associated with management in the hierarchy patterns disappear. In a Decentralized Network there are no managers, directors, VPs, or SVPs. You commonly won't even find executive roles beyond those required by law. The decision making protocols used in Supportive Hierarchy are made more robust to account for all decision making, including governance decisions. Product development in its true form falls into the complex domain. If you know precisely what you are building and how the market will respond to it, you are not developing product, you are building it. In such a case you are either square in the complicated domain or your hubris has gotten the better of you. I suspect the latter, but I suppose that's another blog post. Let's see if we can wrap this up and attempt to clarify why a "Leadership Team" is likely an indication of dysfunction. With Dominator Hierarchy and command management style (Chaotic), a leadership team would slow down decisions and speed is paramount to getting out of chaos, which is the primary goal of leadership when in chaos. With Supportive Hierarchy, mentor management style, and decision making protocols, the centralization of decision-making is not necessary. A leadership team is likely an indication of failure elsewhere in the decision making process. With Decentralized Network and facilitative management style, and robust decision making protocols (Complex), a leadership team makes no sense. There is no hierarchy of titles. Everyone is a decision maker. A leadership team makes sense is if you have a dominator hierarchy with coordination management style (Obvious). Decisions are made at upper levels of the hierarchy and we are not in chaos, so the small amount of extra time a leadership team would take to coordinate and make a decision is a worthwhile trade-off for the increased average in value of said decisions. So if your local fast food chain has a leadership team, that makes sense. If their headquarters has one, however, it suggests they fail to recognize the complicated or complex nature of the work they do. The leadership team is an indication they are operating under a suboptimal organizational design pattern and/or management style with insufficient decision making protocols. In other words, the existence of a leadership team at headquarters is a smell.